As noted in Maryland's Baltimore Sun, Katie Johnson, wife of Philip, died suddenly in 1889 at the age of just 28 years. Her remains rest at Oak Hill Cemetery in Newnan, Georgia next to those of the couple's two year old daughter Hannah (1886-1888). Thy memory shall ever be A guiding star to heaven. On one side of Kate's tombstone was carved a beautifully intricate basket full of flowers. The bounty within is plentiful and diverse. Using the great reference titles of Stories in Stone and Forever Dixie, below is the symbolism of those flowers I recognized. Bellflower: "In the symbolism of flowers, the bellflower is given the attributes of constancy and gratitude…"
Daisy: "[A] symbol of the Virgin Mary; like Mary's love, it can grow almost anywhere…"
Fern: "They symbolize humility, frankness, and sincerity." Madonna (Easter) Lily: "As a symbol of purity, its symbolism can be extended to casting off earthly things and attaining heavenly / spiritual qualities…"
Rose: "In Christian symbolism, the red rose became a symbol of martyrdom, while the white rose symbolized purity…"
Are you wondering what's up with all the "letter" posts? 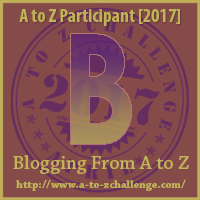 I am participating in the Blogging from A to Z Challenge (links to official page). This challenge lasts through the month of April, with Sundays off. Each day follows a different letter prompt, in order, from A to Z. Click here to see all my letter posts on one page (in reverse order). This blog as a whole is one of my themes – telling the tales of tombstones, primarily from those found in the Southern United States and usually the State of Georgia. You may follow along with me by email and other social media platforms listed at the top of the sidebar. I and other bloggers in the challenge on Twitter will also be using #atozchallenge. Though this is my second year in the challenge, it's my first with two blogs. I am also participating with Lincecum Lineage. Though it is a one name study blog, my theme there is "kinfolk direct." These genealogy and family history posts all involve a direct relative. Are you participating in the challenge, too? Please leave a link to your blog in the comments, I'd love to pay you a visit. Good luck to all involved! That's a very intricate stone. My husband and I enjoy visiting old graveyards. I like making up stories about the people. You almost wonder if her death was somehow grief related after losing her child. You are probably right, Danielle. Very plausible. Interesting about the meaning of the flowers. I never think about stuff like that. Thanks!